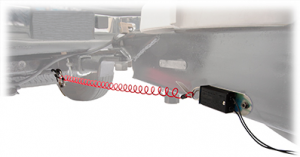 Electric trailer brakes operate via a brake controller located near the driver’s seat. The braking strength can be raised or lowed to suit the strength required. 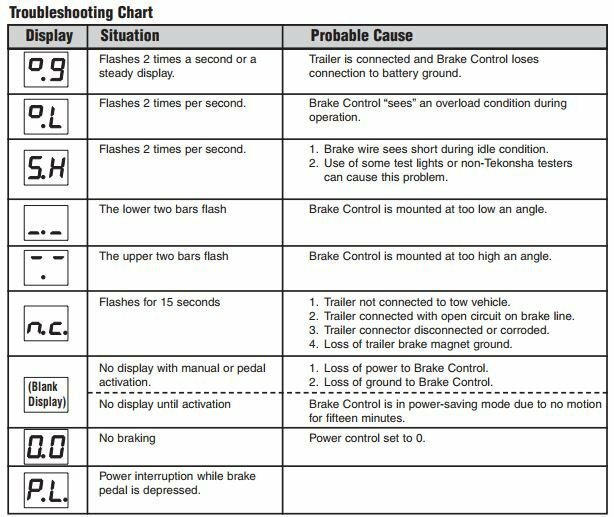 Note: An electric brake controller must be used at all times when towing our electric braked trailers. Place the controller level and straight and plug the charge cable into your 12v car charger. The LED screen should display the symbol below, signifying that the controller is connected. Hold the handbrake in to display the braking strength. Whilst the handbrake is held in, roll the power wheel to choose the correct braking strength. If the trailers brakes are locking up, turn the braking strength down. If the trailers brakes aren’t breaking enough, turn the braking strength up. There should be unison in breaking between the trailer and the towing vehicle. The trailers brakes should not be used to pull up the towing vehicle. The breakaway cable will apply the brakes if the trailer disconnects from the vehicle. Ensure the cable is connected to the vehicle (not the shackle or chain). Ensure the cable is not dragging on the ground. Do not operate the trailer without the breakaway cable plugged in. Below are some common faults and the reason behind them. If any of these faults arise, please contact Adelaide Trailer Hire.